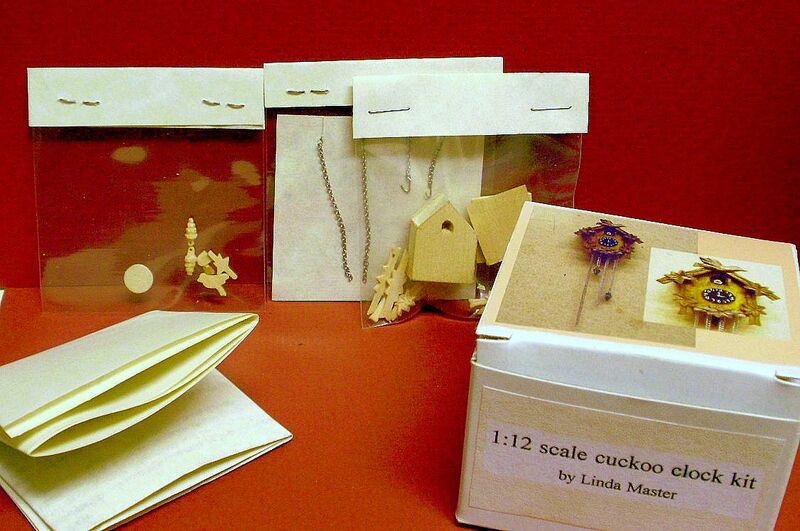 Custom made one of a kind functioning dollhouse accessories. I work in several different scales. Having trouble finding a particular item? 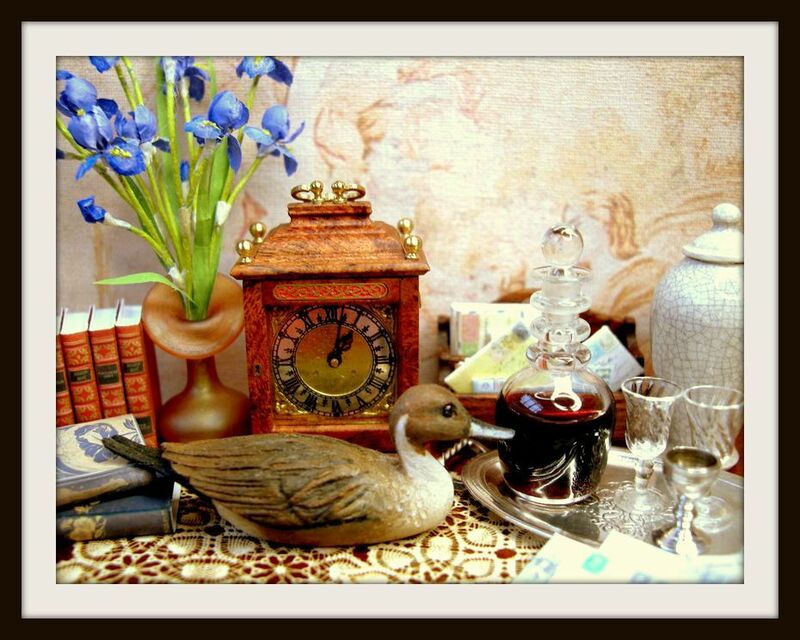 I can create it for you from photographs to your specifications. 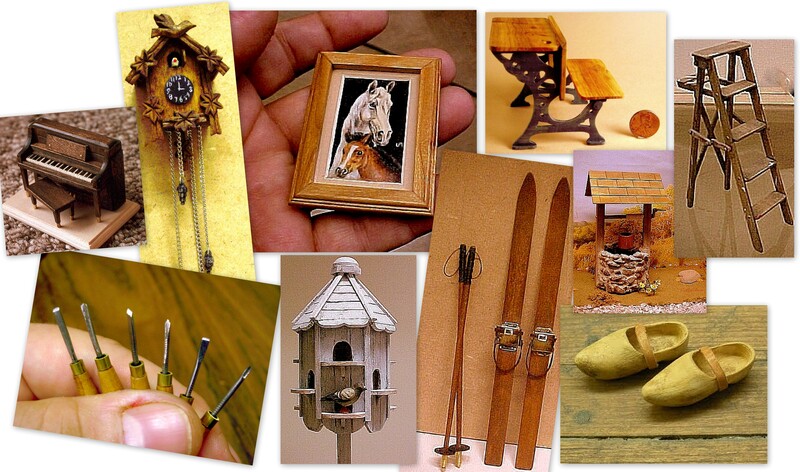 Introducing my new line of European antique miniatures! 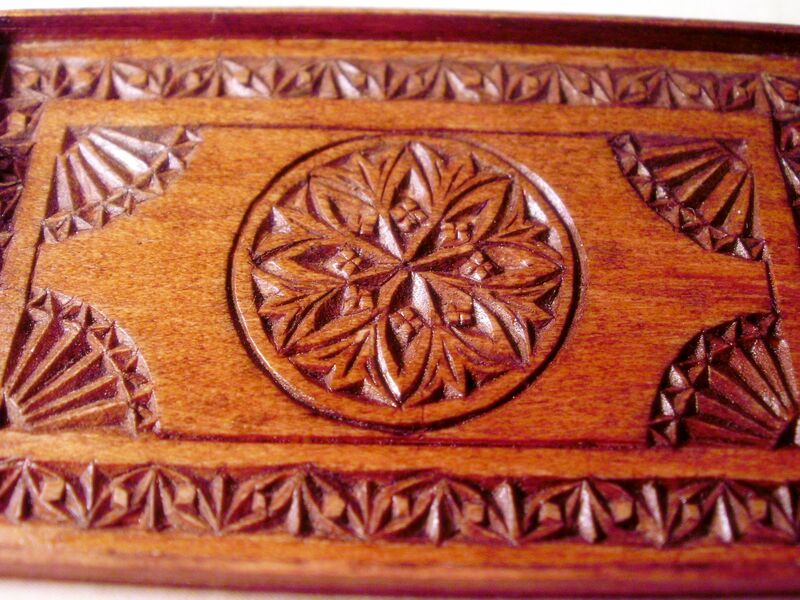 This is a copy of an antique chip-carved tray. 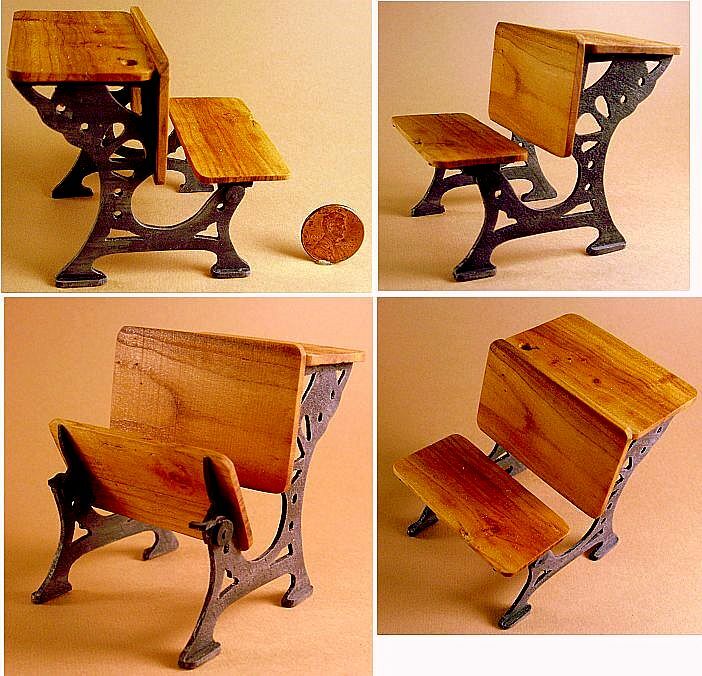 I'm guessing the original is well over 100 years old. 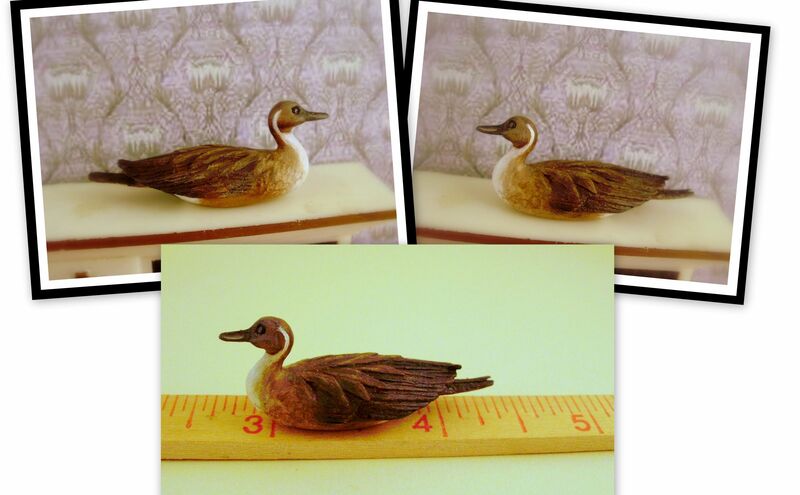 I carved it out of pear wood. Each one of the tiny squares in the border takes 30 separate cuts. 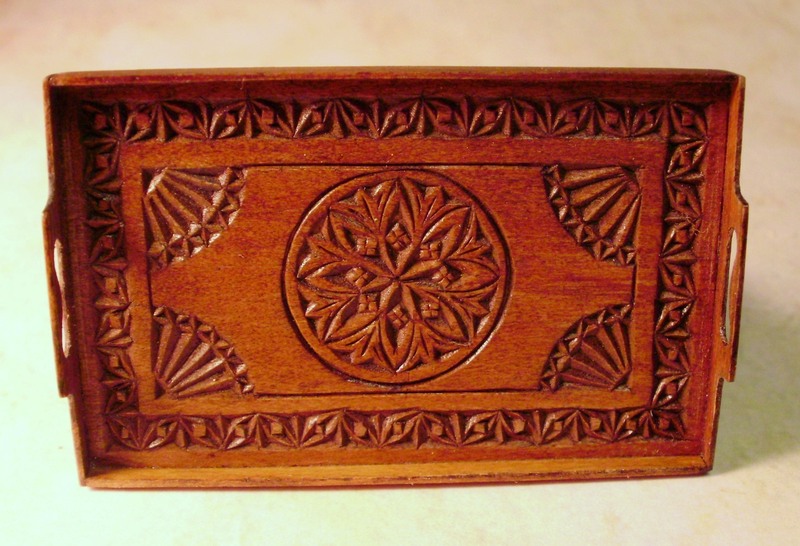 It took at least 25 hours to carve the bottom, not counting drawing the pattern on the wood and putting the piece together. The tray measures 2" x 1-1/4" That is large enough for it to carry a teapot, 2 cups and saucers and sugar & creamer. 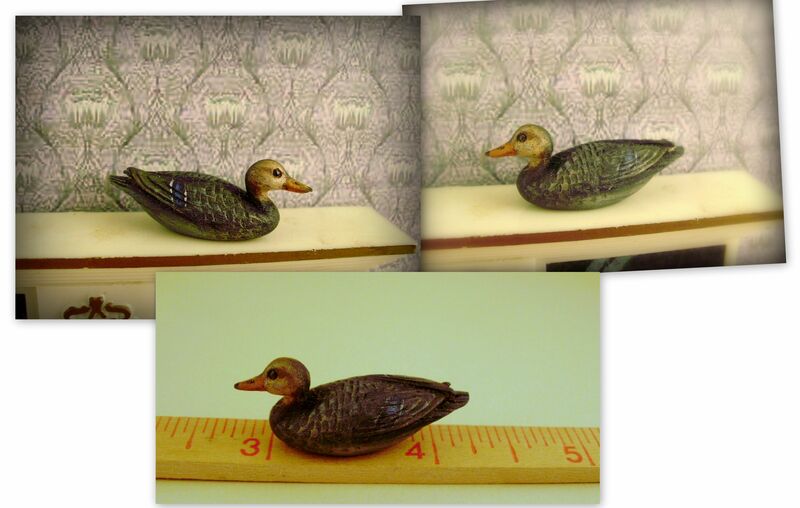 However.... when not in use it would look fine displayed as a piece of art, perhaps on a shelf or mantle. 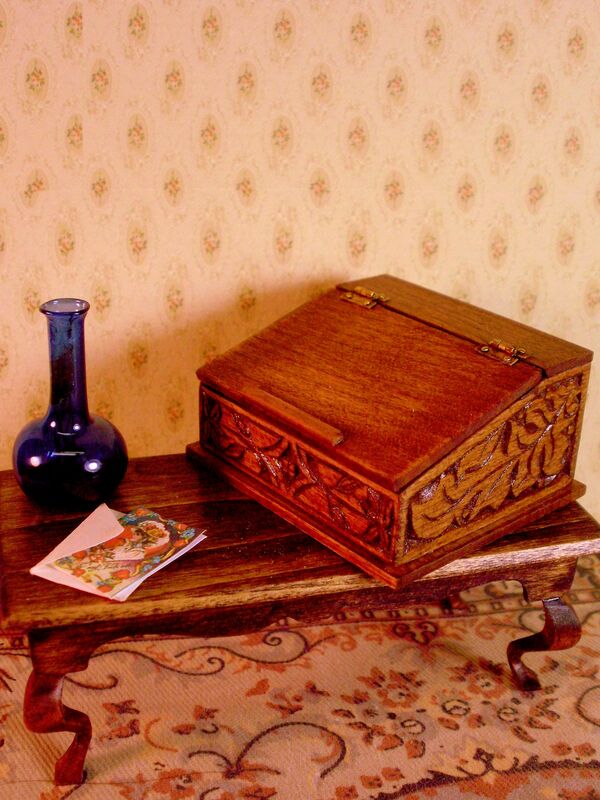 1700's pipe box. 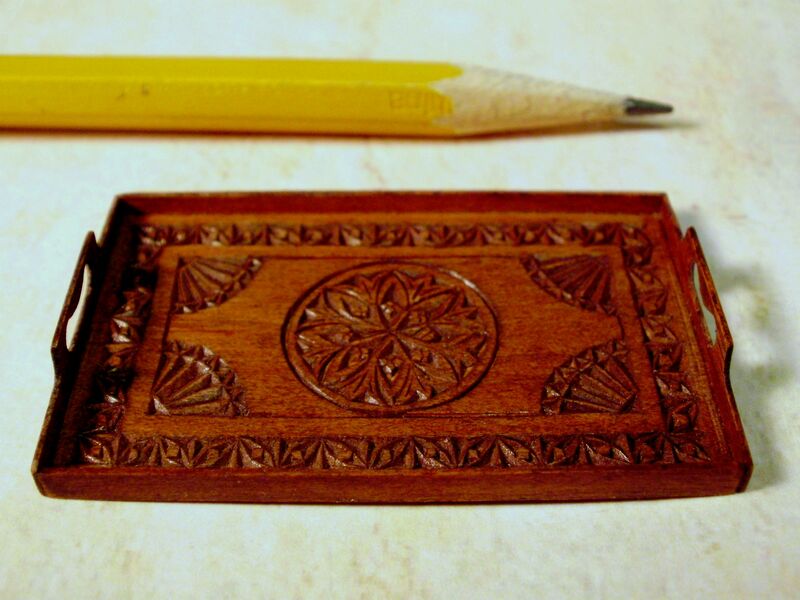 Chip-carved, cherry wood. 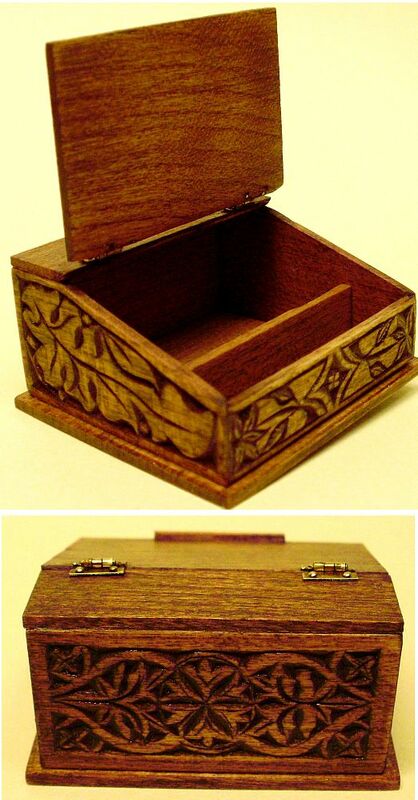 Has two compartments for tobacco. Tiny turned brass knobs. 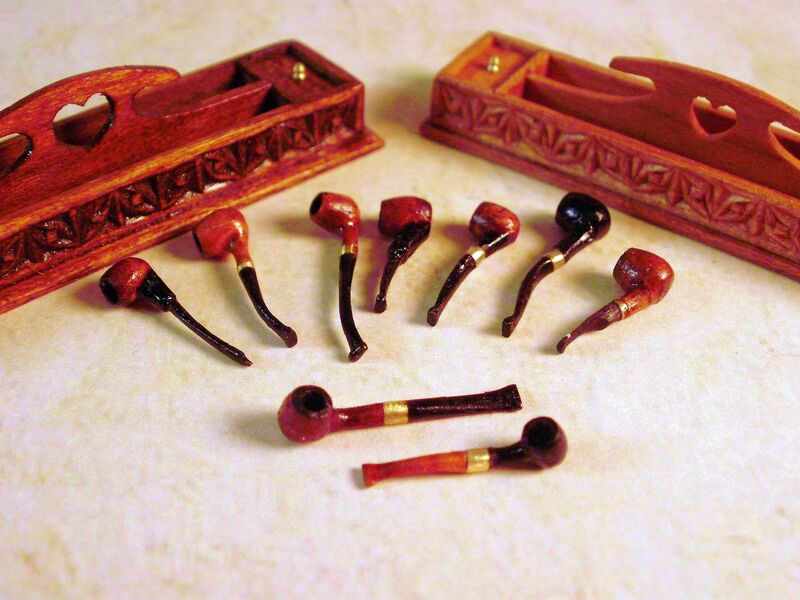 Pipes hand carved from African Blackwood, Pear and brass. 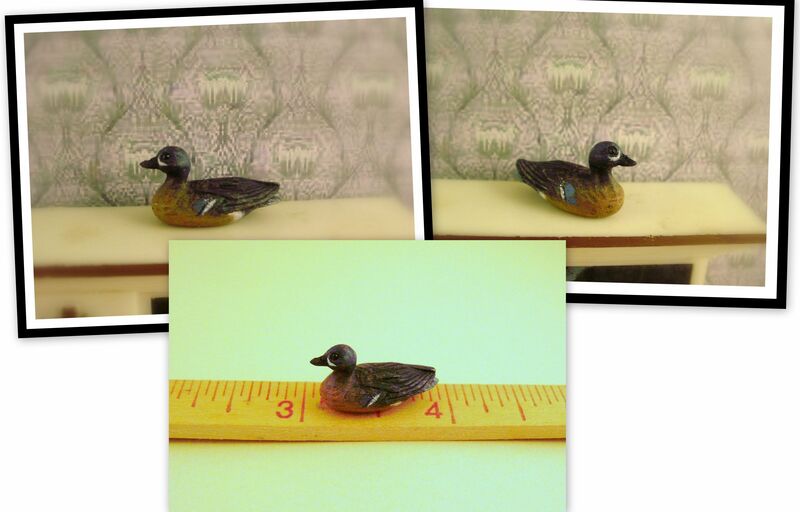 Price includes two pipes. Available in light or dark stain. Additional pipes available. 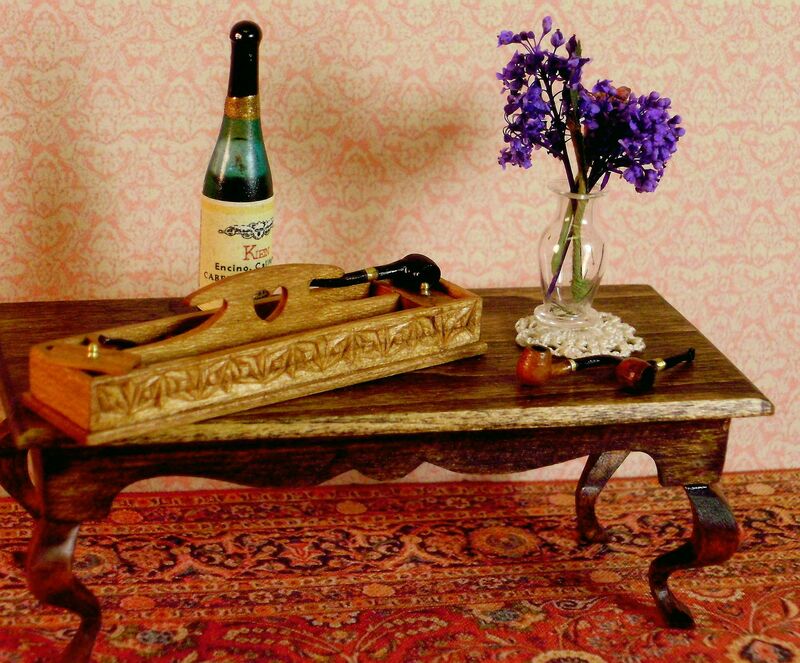 Contact me for selection or order a custom pipe. 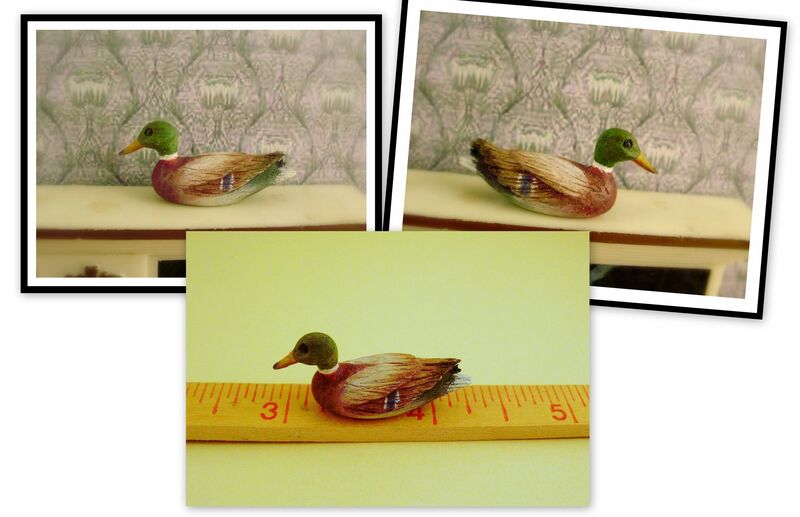 $200.00 plus $12.00 shipping. Additional pipes $15.00 each. 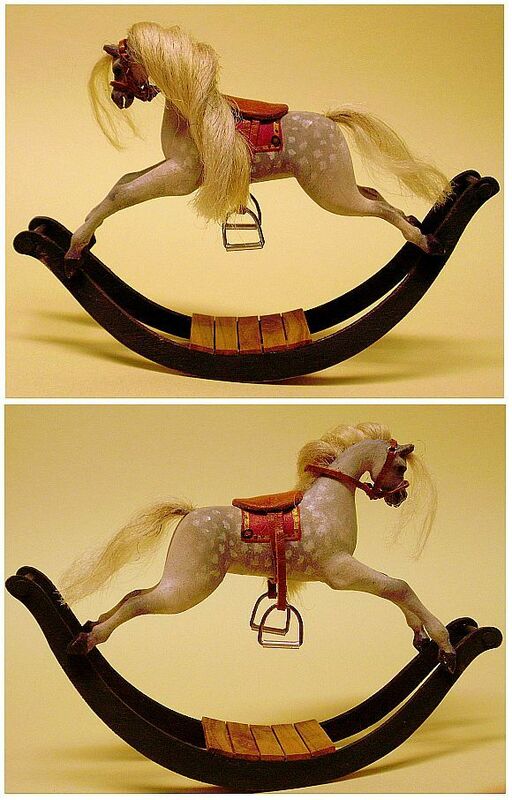 1800's English rocking horse. 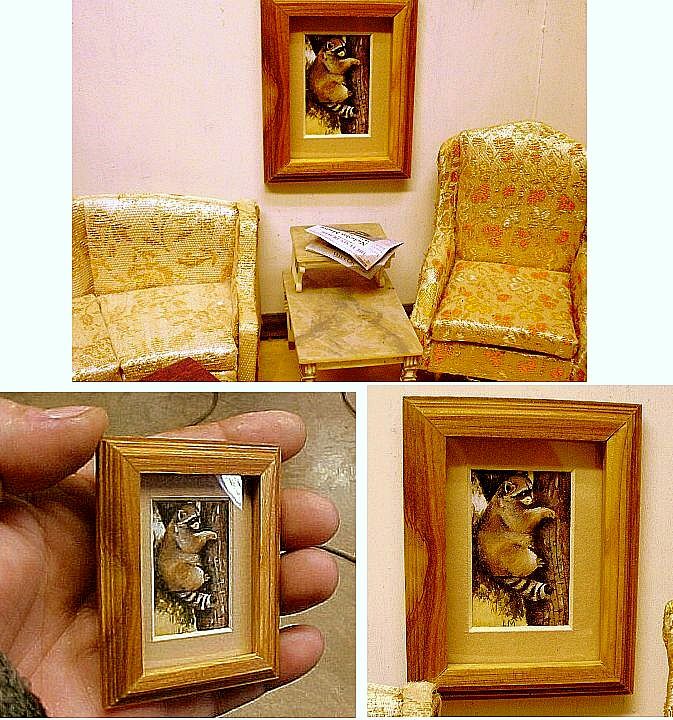 Hand carved wood. Leather saddle and straps. 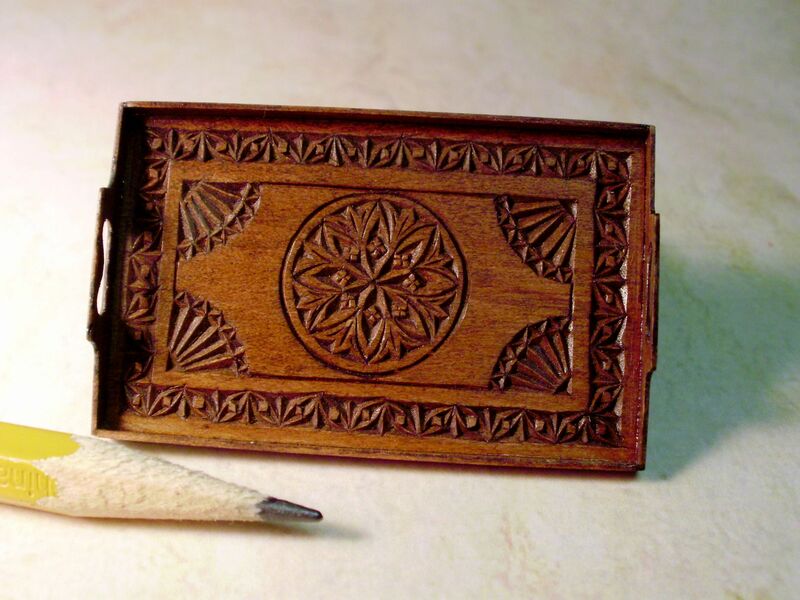 Ink stand carved from Pear. Turned brass inkwell. Tiny feather quill. 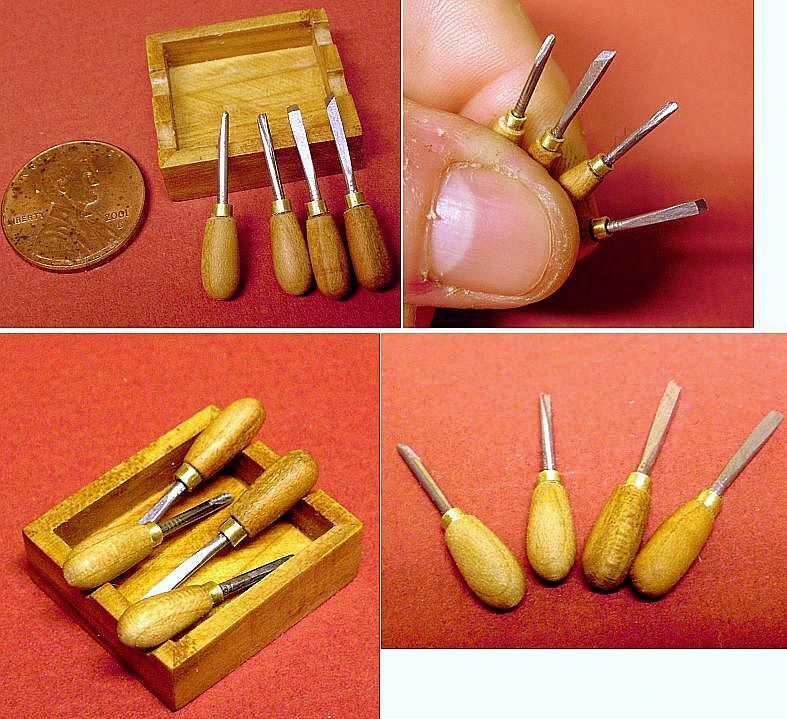 While strictly a dollhouse accessory, these woodcarver's chisels can actually cut! They feature real metal blades in several different profiles, turned handles in either cherry or maple, real brass ferrules, and a matching box. I made these drawings and paintings in the early 1980's. Then in the mid 90's a neighbor cut down his little cherry tree. I took it home, built a jig and milled down miniature boards. 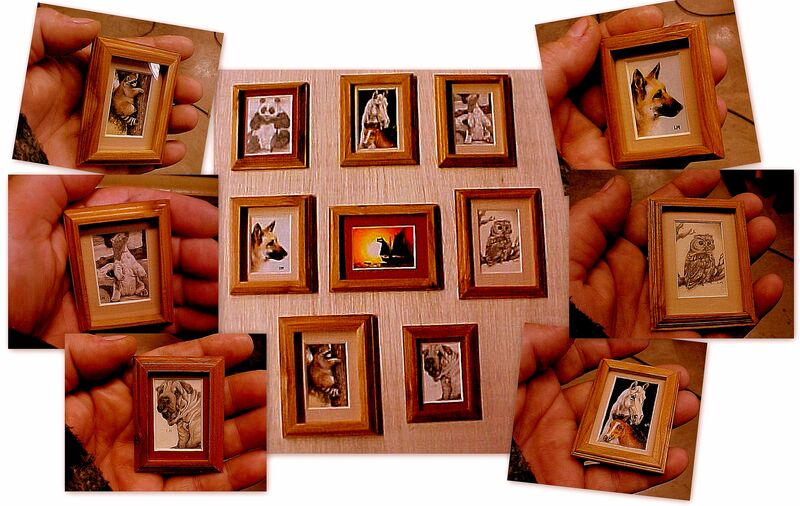 Fast forward to the 2000's and I took those beautiful cherry boards and made frames for my drawings and paintings. 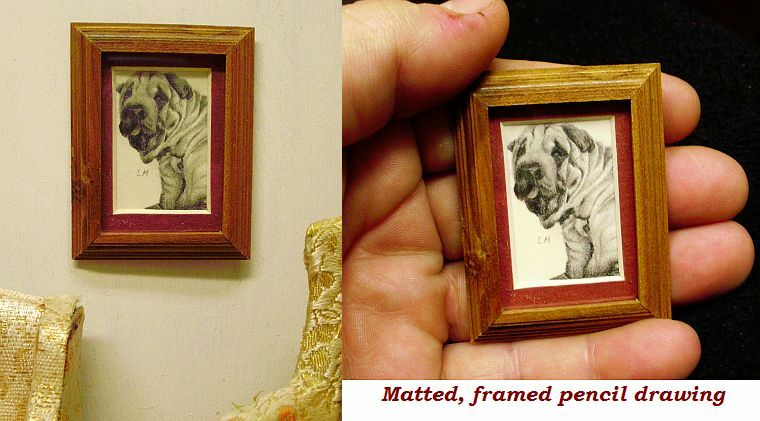 Framed from scratch from the tree! 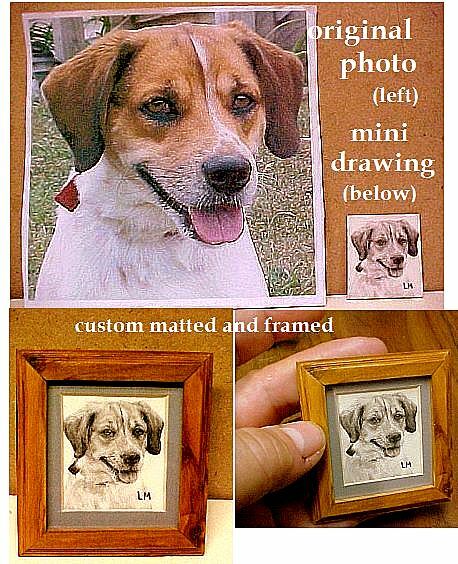 Have your pet drawn from your photos! This gorgeous cherry wood has perfect "in scale" grain and knots. 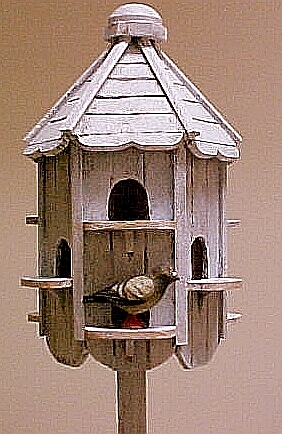 Above left, a hand made wood dovecote with a hand carved wood pigeon, and above right, a hand made wishing well. 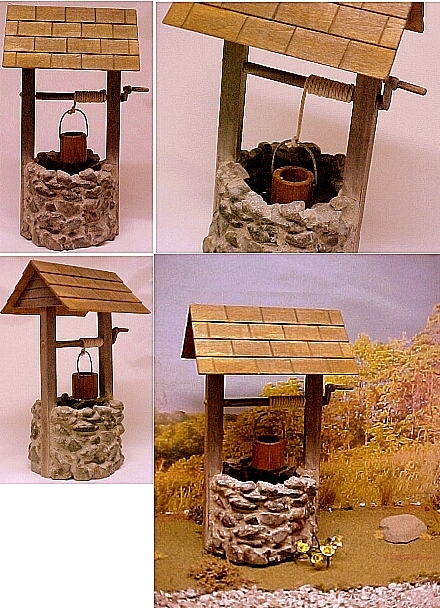 Made of stone and wood, the handle cranks and lowers the bucket. 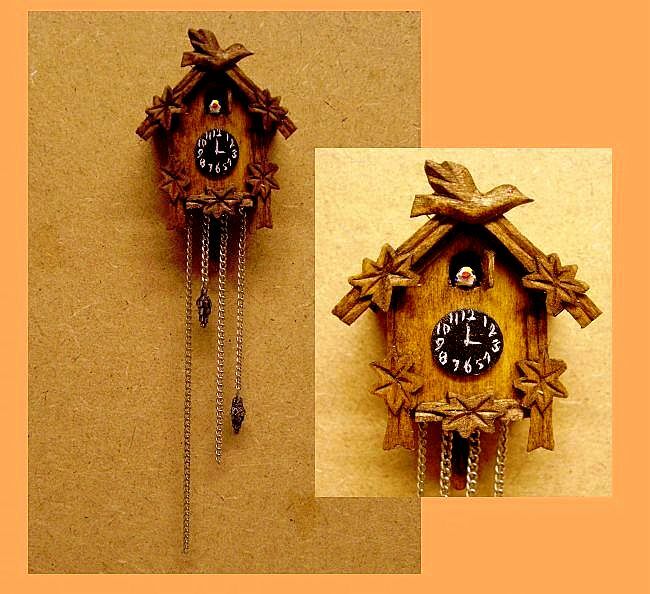 This beautiful NON-WORKING 1:12 scale cuckoo clock comes ready made or as a kit. 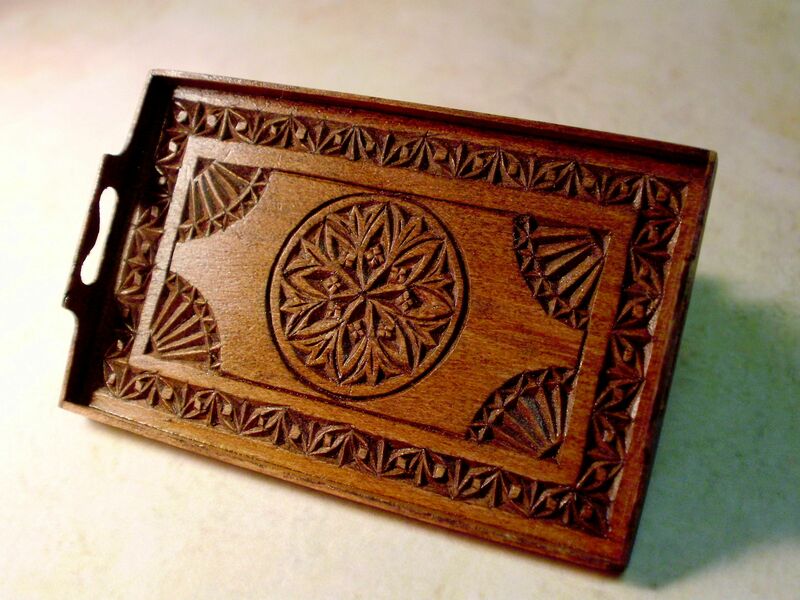 All the pieces are hand carved, assuring no two are alike. 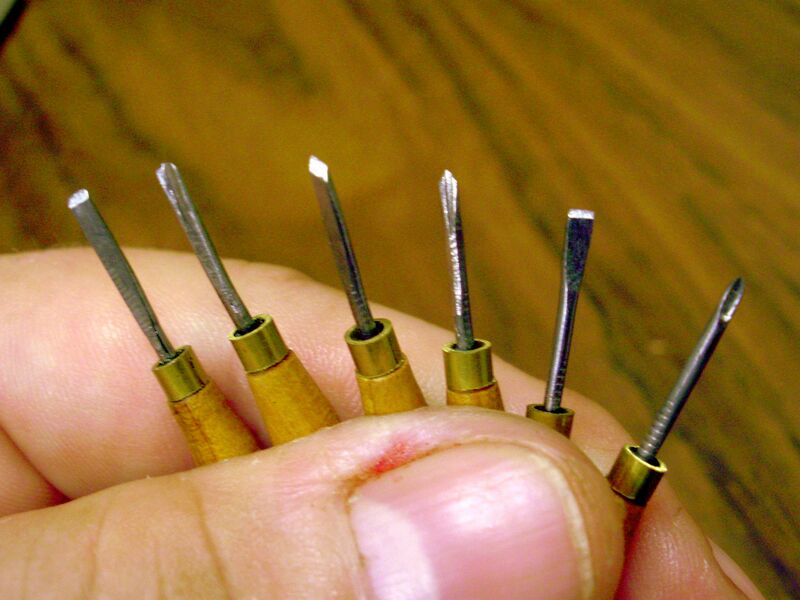 You assemble and finish. Just click the "buy now button to purchase a kit. 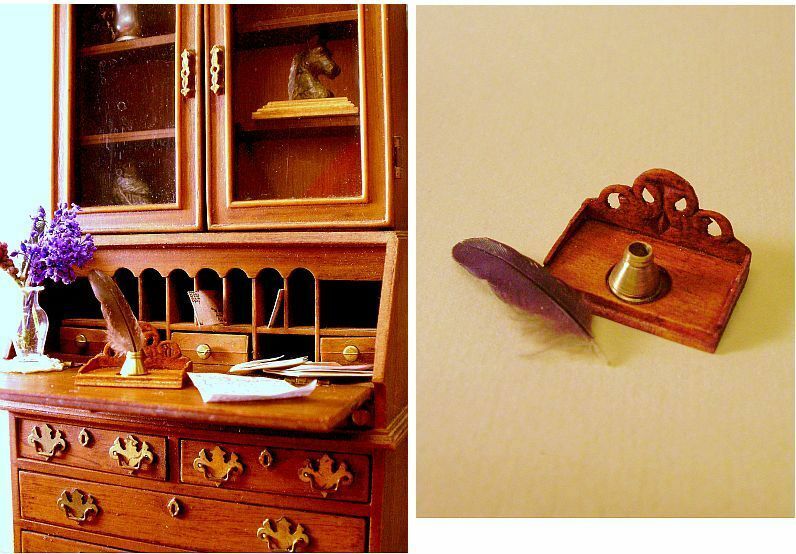 Tiny knick-knacks for the dollhouse. 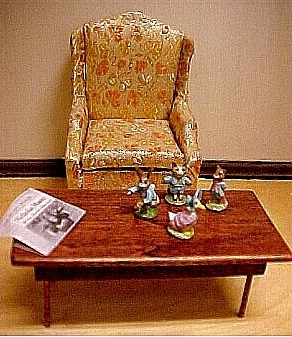 Above left, hand carved wood figurines resembling their ceramic full size counterparts. 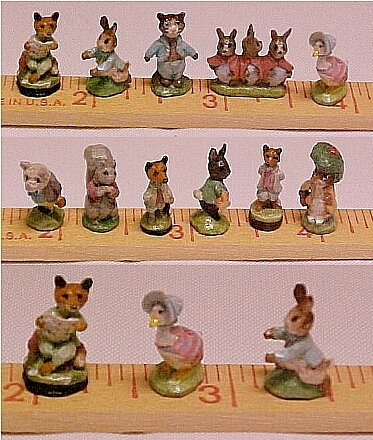 Above right, little gnomes, perfect for the garden or whimsical scene. 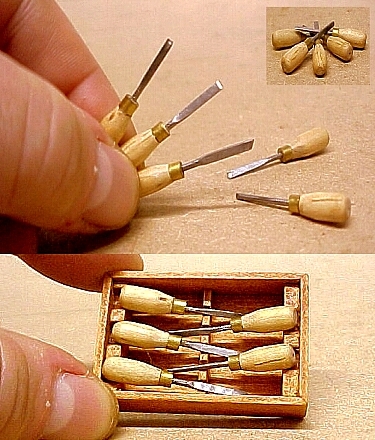 Works in 1:12 scale or 1:24 scale. 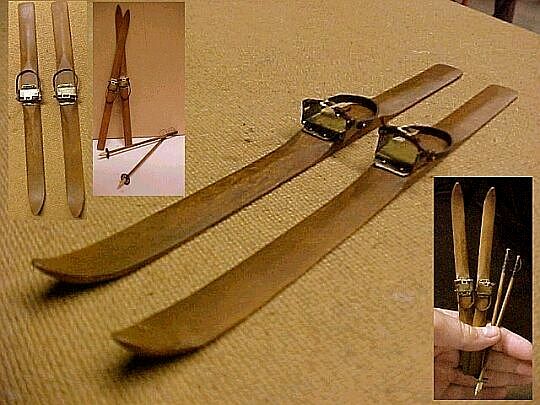 Above left, a pair of vintage skis, 1:12 scale, hand carved wood with working boot bindings. 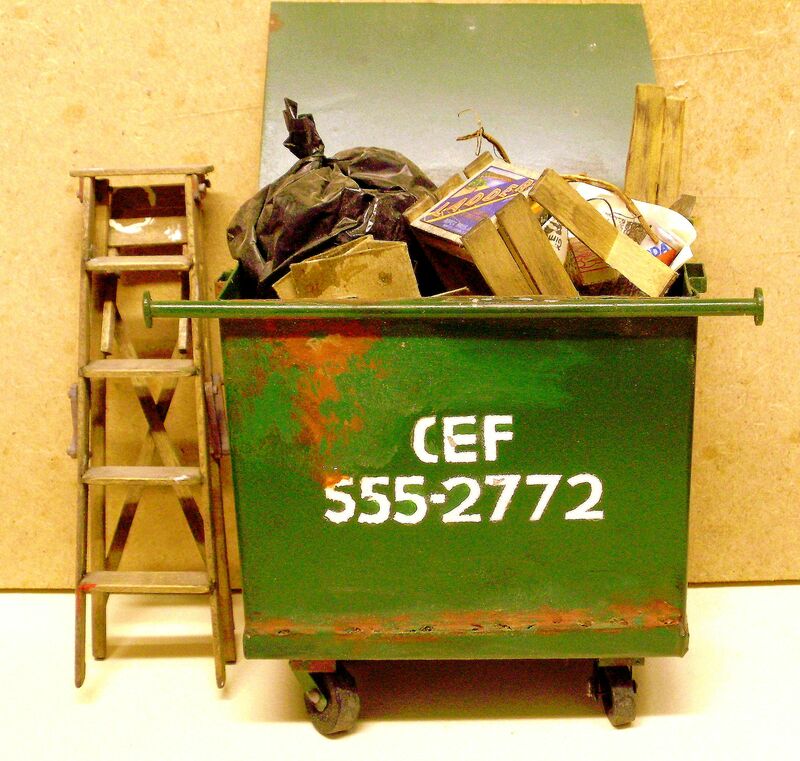 Above right, a 1:12 scale metal dumpster with rolling, swiveling wheels and a working lid. 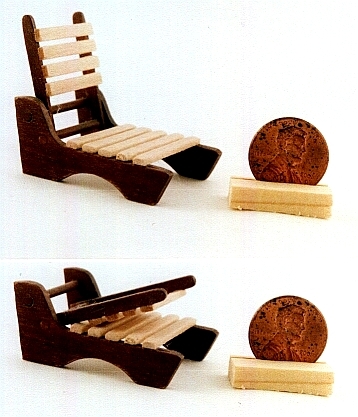 Shown with the hand made wood folding step-ladder.